What are you doing new year’s eve? Our plans are pretty simple. We’ll be staying at home, just the two of us; we’ll probably turn on the television to see how the rest of the world is celebrating. But we’ll be right here all cozy and warm and safe while the new storm heads our way–that is if the weather forecaster was right. Maybe we’ll be able to stay awake until midnight to welcome 2010; maybe not. It’s okay either way. It’s not that I feel sad about the year that’s passing–we had some great times in spite of the state of the world, the trip to Peru, making new blogging friends, and visiting with old friends and family back east–it’s just that it’s hard to predict what’s in store for the next one. We’ll just look ahead to the good things we’re planning, including a family trip to India in June. That’s when we’ll introduce Ben and Frank and the grandchildren to Hubby’s family on that side of the world. Now it’s time to let you in on a little secret. 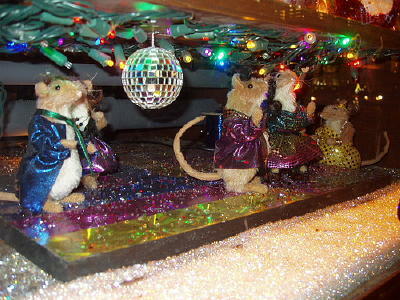 Mice party too! I know this thanks to the pictures my daughter in New York took of Henri Bendel’s storefront. I think this is a perfect time to let you in on a few of the the details of partying from the viewpoint of . 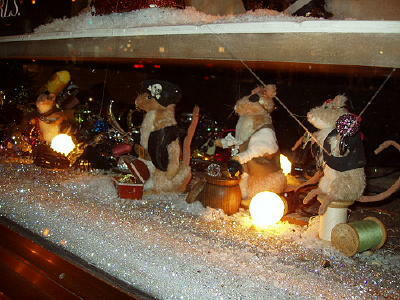 . . city mice. How about these guys? Let the other mice in Bendel’s play all they want. Meanwhile these little robbers will take advantage of all the noise and commotion to make off with this swanky little Swarovsky crystal necklace . . .
and these pirates (2009 was a good year for pirates) gather exotic booty (thread, thimbles, lipstick, etc.) that must have fallen through the cracks from the exotic world of the display above them. 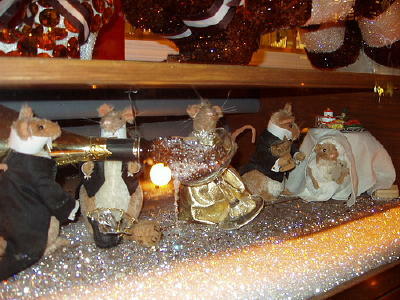 I wish I could show you the tiny little mouse orchestra playing a symphony nearby . . . but you’ll have to imagine it yourself while this tiny bride and groom help themselves to a human-sized bottle of champagne . . .
. . . Hey! 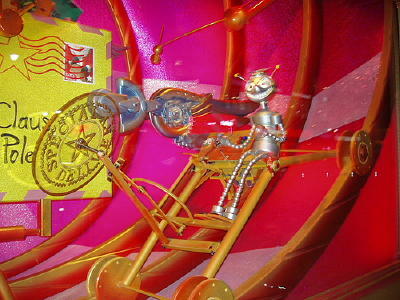 What’s that guy (Santa’s robot helper) doing here? He doesn’t belong in this story! He is sooooooooo last year! 10! 9! 8! 7! 6! 5! 4! 3! 2! ONE! 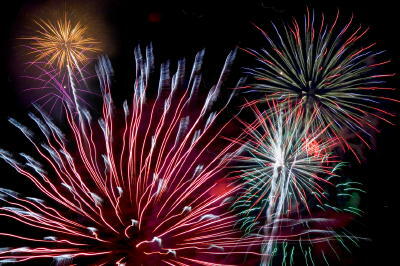 H A P P Y N E W Y E A R E V E R Y B O D Y ! This entry was posted in Animals (are people too), Musings, Photography, sunny side of life by Alice. Bookmark the permalink. Aren’t Bendel’s windows the best? May you and yours be blessed with all the good things in 2010! 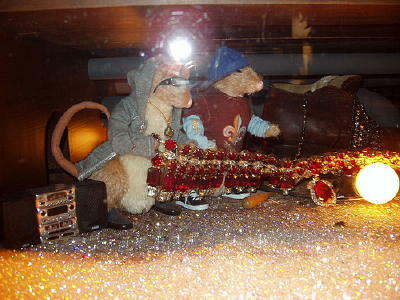 I love the mice party – I’m glad she took the photos. We did “proper” New Year in, a big meal and then grapes (12, to be eaten at the midnight and finished by the last chime) and champagne. Then we went to the English ex-pat hangout where we lifted our glasses again an hour later (midnight GMT) to the sounds of Big Ben. Thanks for the pictures. We were near Bendel’s one day, but the weather wasn’t conducive to walking the extra blocks. Happy New Year to you and hubby. Thank you, Rebecca. So nice to hear from you again. And all the best to you as well! Hear! Hear! I’m willing if you are. I wish we had such exuberantly happy and inventive mice in our basement. Alas, we have none at all. Your pictures must suffice. Happy New Year! Hello Grace! Great to see your name here! I was hoping you’d like my little mice. I have other mouse tales to share–not as cute and amusing as that one, alas. Maybe during the coming year as my muse permits.